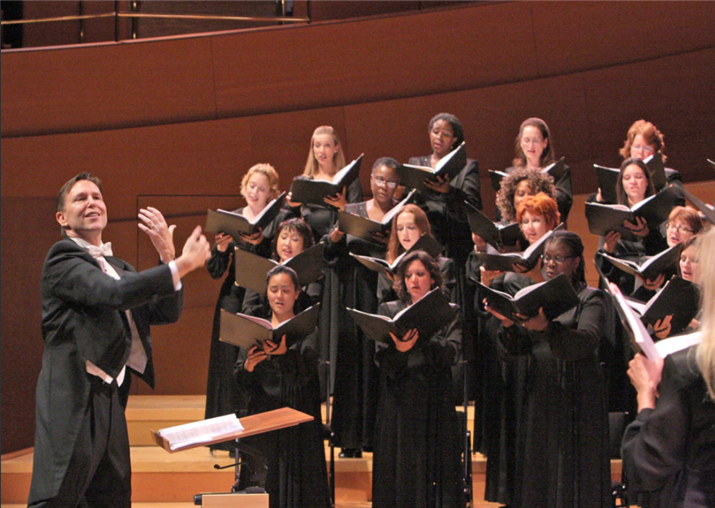 The pioneering Los Angeles Master Chorale will launch its 50th season with élan this Sunday, September 22nd at 7 pm at Walt Disney Concert Hall, with a multi-media retrospective concert, a historical exhibition, and a champagne toast for the entire audience. Kiki and David Gindler Music Director Grant Gershon will be showcasing the history and artistry of the chorus by performing selections of its diverse and groundbreaking repertoire, shining a light on signature selections by each of the four music directors who have lead the Chorale in its fifty-year history. 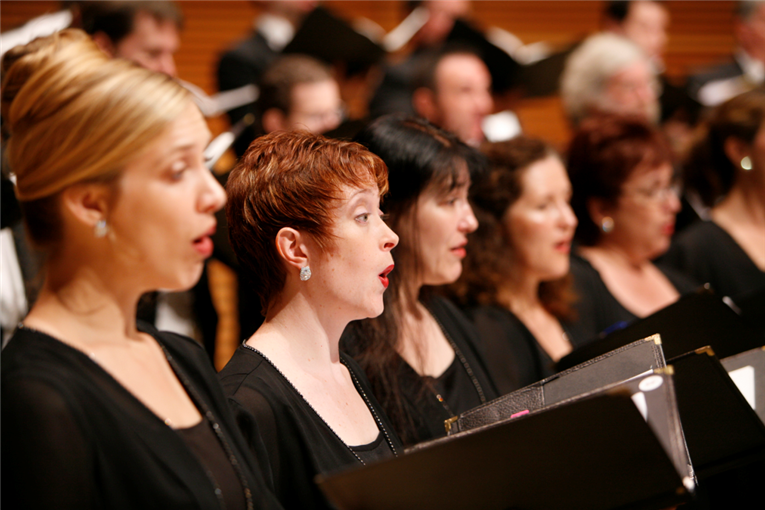 Audience members will experience a sampling of past programs — Renaissance motets for Roger Wagner, Scottish folk songs for John Currie, O Magnum Mysterium for Paul Salamunovich, and Unclouded Day and Spem in alium for Grant Gershon — enhanced by rare video footage and still photos from the annals of the choir. The finale will honor the contributions of past members when 100 Chorale alumni traveling from across the country will join the choir’s 115 current members and sing together. The entire performance will be hosted by musicologist Alan Chapman of KUSC Radio. The accompanying gallery exhibition in BP Hall, including personal artifacts of those who have helped the ensemble develop over the last half-century, will also introduce the first phase of the Chorale’s interactive electronic archive. Capping the celebration will be a complimentary champagne toast for the entire 2,200-member audience with the Chorale. 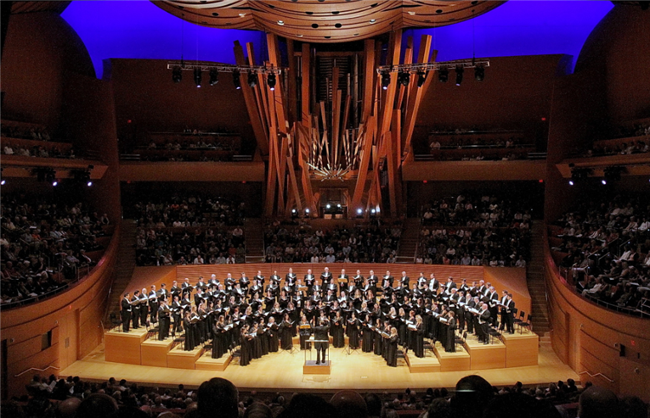 To share in the excitement and prepare for the musical festivities, I have asked Los Angeles Master Chorale President and CEO Terry Knowles to provide a little background and perspective based on her thirteen-year association with the chorale. Diane Sippl: How do singers train or prepare for the audition? Terry Knowles: Most of the singers have studied privately with coaches or voice trainers, at least at some point in the past. Some of them are coaches themselves or currently teach in academic settings. They also sing in the choirs of churches or synagogues. If you see other small or medium-sized ensembles in the Los Angeles area at other venues, then you’re seeing singers of the Master Chorale. DS: How are they selected at the audition? TK: There’s not a lot of change-over. Most of the members sing annually for Grant again. They don’t stick out of the ensemble, but our venue is acoustically live, and Grant can hear individual voices, so he knows the singers very well. Annually, we invite people not in the Chorale to audition. It happens by word of mouth, and they also see our website. They submit a vocal resume and a CD of their singing. If the Associate Conductor, Lesley Leighton, hears them and feels they have the reading and vocal ability, then she recommends them to the Music Director, Grant Gershon. Lesley auditions up to about 250 singers, and of those, Grant hears up to 50 or so. There are not many openings each year because the current singers love being in the Master Chorale. They stay with the Chorale for an average of six to ten years, and their ages range mostly from 30 to 70 years. DS: How is the program selected? TK: Grant is always thinking of programming. He explores his own library, he listens to recordings, and he considers the recommendations of colleagues. In the summer of each year he and I listen to programming ideas for eighteen months hence, so this summer we considered twelve to fifteen programs for a year-and-a-half ahead. We did a survey of the Haydn Christmas Oratorio and did one part (of six) each year for six years. 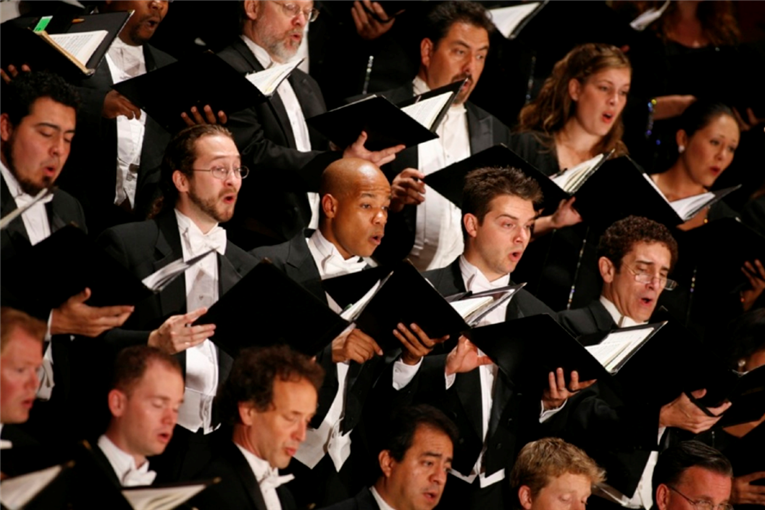 The repertory ranges from Baroque or Early Classical to that commissioned just for the Master Chorale. These commissions are a separate discussion. In the fall we take this programming to the Board of Directors along with the costs and financial matters, and in late January of each year, the program for the upcoming season, fall through spring, is announced. DS: How do the music directors differ from each other? TK: My entire time with the Master Chorale has been with Grant Gershon as the Director. His predecessor, Paul Salamunovich, programmed more liturgical music and big works and was more inclined to use an orchestra. John Currie, a Scotsman, had a fairly limited repertoire, drawing from the Classical and Baroque eras, but he added Scottish musical extravaganzas, fully staged with kilts and bagpipes and the works. Roger Wagner is close friends with Paul Salamunovich and their musical taste is similar — big Romantic works or Classical selections. DS: Are there ever any bloopers? TK: Truthfully, I can’t recall a big blooper — one that signaled a train wreck — or even a particular singer standing out as a soloist. As far as difficulty goes, anything written in the last 75 years is going to be more challenging than Mozart, for example, just to learn the notes. Consider John Adams’s new Passion oratorio, The Gospel According to the Other Mary. This was new music, a big, long work; it had to be memorized and it had to be staged, with costumes and movement, for the Chorale. We had lots of rehearsals before it got to the Philharmonic. This oratorio is two-and-a-half hours of music. We had twelve Chorale rehearsals before we met up with the L.A. Philharmonic, then eight rehearsals with the orchestra, and then fifteen stage rehearsals with movement. Beginning in March of 2013, we did three performances in Los Angeles and then we toured to London, Lucerne, Paris, and New York. In my thirteen years with the Master Chorale, it’s the most ambitious project we have undertaken. DS: What’s the difference between a chorale singer and an opera singer? Are solos a part of the concept? TK: Master Chorale singers are first-rate performers, and over a season, many will step out and sing solo. But an opera solo singer tends to have a bigger voice — a quality and volume that’s needed on stage — and a voice that won’t easily be sublimated for the Chorale. Grant is looking for voices that can blend with each other, that can be in tune together and breathe together. When a hundred voices can sound like twenty, when the audience senses one movement together, that’s when the Chorale really hits the mark. DS: What does it do for the singer to sing? TK: I have not sung with the Master Chorale, but I have sung in other groups. Singers singing together in an ensemble probably experience a kind of connection that orchestra members can’t. As a singer, all you have is your body as an instrument. And there is also text involved for a singer. The text, the poetry, enhances the experience and also the connection of singing with each other. The romance languages, for example — French, Italian — are languages singers have been singing for years; German and Spanish are also familiar. Korean is more difficult because most of us don’t speak it, so we have Korean chorale members who have been coaching us. We have sung in Polish, too, and if we are performing in unfamiliar languages, we bring in a coach, as we did for our Polish singing. As for the Scottish music coming up from John Currie, it won’t have any brogue. 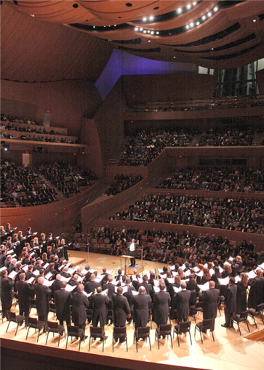 DS: What advantages does Disney Hall offer? TK: Walt Disney Concert Hall is such a gift. We’re starting our 11th season there now. The acoustics there are so complementary to a singer. They add a warmth — not necessarily reverberation — that enhances the sound. It also enhances all that you do. So any blooper, or any program book that is dropped by an audience member — we all hear it! That people are seated facing all sides of the stage adds an extra pressure: if we’re not all singing the same notes and breathing together, a sound will stand out. DS: Well, congratulations, and I wish you more success in the future. TK: Thank you. See you there!